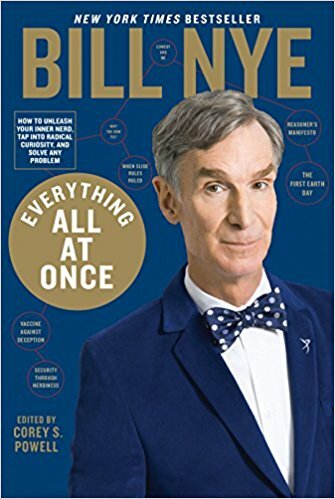 Brooklyn Digest: Books: Bill Nye's "Everything All At Once"
Bill Nye has been the face of science and discovery for over 20 years. The educator, author, and television host has taught us to be more observant and think more critically using humor, music, and scientific visuals in his award-winning educational programs. Everything All At Once, Nye's latest book, now available in paperback, continues these lessons and urges its readers to examine every detail of the most difficult problems until a solution can be found. One of Nye's approaches is to consider "everything all at once," in which he leaves no stone unturned. He writes, "When it's time to act, though, you can't process everything. You can't strain literally every option through the filter of logic; it would drive you mad and take up so much time that you would never end up acting on anything at all. So we have to learn to make decisions with restrictions. We give more weight to some details than to others, and we constantly evaluate what information is most relevant and reliable. Some of the greatest technological triumphs (the Manhattan Project or the Apollo Moon landings, for example) took place under severe constraints. That's what we do here in the land of nerds, whether we're facing a small theoretical problem or a giant real-world one - we take the skills and resources available to us, look at all the angles, and do the best with what we have. "One of the marvelous things about the human brain is its ability to sort out incoming information quickly, or quickly enough to keep our species alive through the last few millennia. We can't know everything about the things and happenings around us, so we have to rely on the knowledge at hand and choose a course." Whether addressing the issue of climate change, discussing personal success, or stripping away the mystery that is fire walking, there are certain strategies that get results. This can be achieved by looking at the world with a relentless curiosity, being driven by a desire for a better future, and being able to take the actions needed to make change happen. Nye uses his trademark wit and humor to deliver his exciting, inspiring call to unleash the inner nerd that exists inside all of us, and he writes. We are living in a time of crisis. Managing and getting past it will require our nerd ingenuity - not just in design and engineering, but also in addressing our emotional needs as people...But if we really want a more peaceful world, we have to dig deep into the human psyche and address the feelings of insecurity. Nerds need to go after fear itself." Nye shares how he created this approach, starting with his Boy Scout training and moving through the lessons he learned as a Boeing engineer, a stand-up comedian, and as host of the acclaimed PBS show Bill Nye The Science Guy. On the role of humor in his life growing up, Nye writes, "I was fortunate that humor was valued in my family to the point where it seemed completely normal to spend our days trying to outdo each other at being funny...During my childhood...I just knew I enjoyed being funny and liked the way people responded to it...When I went to college, science and engineering mingled with comedy and performing in my budding, wrinkling brain." Each chapter of the book describes a principle of problem solving that Nye himself uses, key tools that can lead to a richer, more meaningful life. Nye believes we'll never be able to tackle our society's biggest, more complex problems if we don't even know how to solve the smallest ones. Bill Nye has always made science approachable, and he succeeds immensely with Everything All At Once.